Japanese Prime Minister Shinzo Abe visits the Anne Frank museum in Amsterdam, weeks after vandalism of her diary in Tokyo. 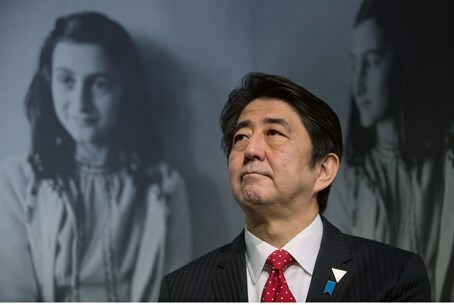 Japanese Prime Minister Shinzo Abe visited the Anne Frank museum in Amsterdam on Sunday, AFP reported. "We would like to face historical facts in a humble manner and we would like also to pass on the lessons and facts of history to the next generation," Abe said during the visit to the Jewish girl's former hideout. "By doing so I wish to encourage peace in the entire international community," he told journalists, while standing in front of photographs of Anne Frank. The visit comes several weeks after more than 300 copies of Anne Frank’s diary, publications containing biographies of her, and other related material were torn at many public libraries in Japan. The thefts raised alarm at what some perceived to be a rightward shift in politics driving the attack. The Israeli embassy donated 300 new copies of the book to local libraries after the incident. In Amsterdam on Sunday, Abe noted the "deep connection" between Japan and the Anne Frank diary, and the fact that many Japanese visit the museum. "When we look back at the 20th century it is fair to say that it was the century characterized by the violation of basic human rights," Abe said. "And looking ahead to the many years of the 21st century I would like to ensure that we will never see the same things happening, and I share the responsibility of realizing this goal," he added, according to AFP. Tokyo police have arrested a 36-year-old man suspect in the vandalism of the diary, without indicating a motive for the crime or identifying the suspect, who they said has admitted to the vandalism. Abe described the vandalism as "regrettable". "The authorities are looking at his motivations. I hope we won't see similar occurrences like this in the future," he said. They were caught and sent to Nazi concentration camps where Anne and her sister died of typhus in 1945. Anne's "Diary of a Young Girl" was added to UNESCO's Memory of the World Register in 2009. The Anne Frank House is a dedicated museum open to the public.